Last week we began Mark Chapter 12 and we discovered that Jesus began teaching His disciples about what biblical stewardship is all about. We saw that as disciples we are called to be stewards of all God gives us. A steward is a manager. We own nothing. God owns everything; we are simply managers. Since God owns it all, He holds the rights that come with ownership. Every decision is a spiritual decision. We looked at 2 sections The first was the parable of the vineyard and through it we are called to be good stewards that respond to what God has given us. The next section was a scene where the Pharisees and the Herodians try to trap Jesus by asking about taxes and Jesus reminds them of the truth that God is the owner of it all and we are to honor Him above all. In that process Jesus challenges us to do the same thing to place God at the first place. Jesus having shut down the Pharisees and the Herodians is now approached by the Sadducees. They held that the first 5 books of Moses were the word of God but they rejected the prophets. Now in order to understand this exchange we must understand that the Sadducees did not believe in the resurrection. They pose a question about something that they don’t even believe in order to trap Jesus into a foolish argument that they believe they can win. And notice the question, “whose wife will she be?” They were asking, “who does she belong to”? almost like property. This could have been because they did not want the responsibility of caring for her, or they wanted to know who had the rights to control her. Either way it was a question of possession. But Jesus puts them in their place. First He tells them they do not know the scriptures. That would have been a slap in the face because they believed they knew the scriptures better than anyone. But second He tells them thay do not understand the power of God. He then tells addresses the concern. First is the marriage issue. Jesus tells them that after the resurrection there will be no marriage. At first this strikes at the heart of us who are in a loving relationship with another person. The way we think is I love the person and I will always love them through all eternity. But Jesus says you do not know the power of God. When we see Him, when we come into the intimate relationship He has designed for us, the love we feel today for that other person will be so small that it will not even look like love. Think of it like this. How many of you remember your first love? For some it was when you where a little child. I remember see little kids saying I love her or I love Him. We are going to get married. For others of you your first love was as a teenager. In either case we as mature adults look at those relationships and think how cute. They really have no idea what love or a marriage is really about. When they get older then they will understand the depths of what that is really about. I believe God is the same way with us. What we call marriage and love is a pale tiny concept of what it means when we are in Heaven. Then He addresses the fact that they do not know the scriptures like they think they do. He points them back to the story of the burning bush with Moses. Something they would have been all to familiar with and points them to the fact that God is the God of the Living not the dead so they can see that God has the power to do anything including raise the dead. Interestingly enough Jesus in every one of these questions and responses challenges our understanding and trust in God as our Lord. So how does this relate to our stewardship? Every relationship we have is a gift from God to be stewarded well. The truth of the question from the Sadducees was a question of how do we value the relationships we have. Ultimately Jesus gives us relationships for the purpose of displaying His love to the world. Charles Sheldon many years ago wrote a book called In His Steps. It became the basis several years ago for the WWJD movement. WWJD stands for What Would Jesus Do? While this questions is a profound one, I think it can have a tendency to make us put on a mask and act like we think Jesus would act without the same motivation behind it. I think a better question might be HWJL? How Would Jesus Love? Jesus tells us that heaven will be unlike earth. There will be no fickle relationships. There will be no need to be married, because the love of our lives will be Jesus. And the truth is life will not end when we die. Because physical death is only temporary. If we are in Christ we have the promise of eternal life with Jesus just as Abraham, Issac, Jacob, and Moses have experienced. That make it all the more important to be good stewards with the time we have here and now to be on the mission He has created for us. To love those who God gives us influence with in such a way that they desire a relationship with the one who gives us that love. Matthew and Luke both record this confrontation. 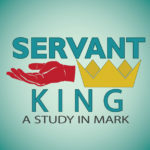 While Mark says he was one of the teachers of the law, Matthew tells us he was a pharisee and that he desired to trap Jesus with this question. The Pharisees had developed a system of 613 laws, 365 negative commands and 248 positive laws… By the time Christ came it had produced a heartless, cold, and arrogant brand of righteousness. Ultimately, thoughts.Jesus distills all of those 613 laws down to 2 simple intertwined thoughts. 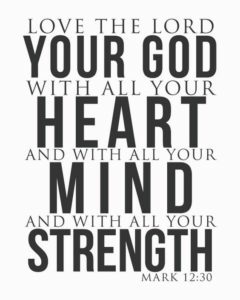 The first statement is Love God with everything. This is the ultimate idea of stewardship. Notice there are 4 sub categories that Jesus lists. Heart, soul, mind and strength. In short this encompasses every aspect of life. This is the ultimate definition of good stewardship. To use everything we have our will, our emotions and passions, our thoughts, wisdom and knowledge, and all of our resources to honor and love God. This is where Jesus reminds us of the mission. We are to love Him supremely but also to love others sacrificially. 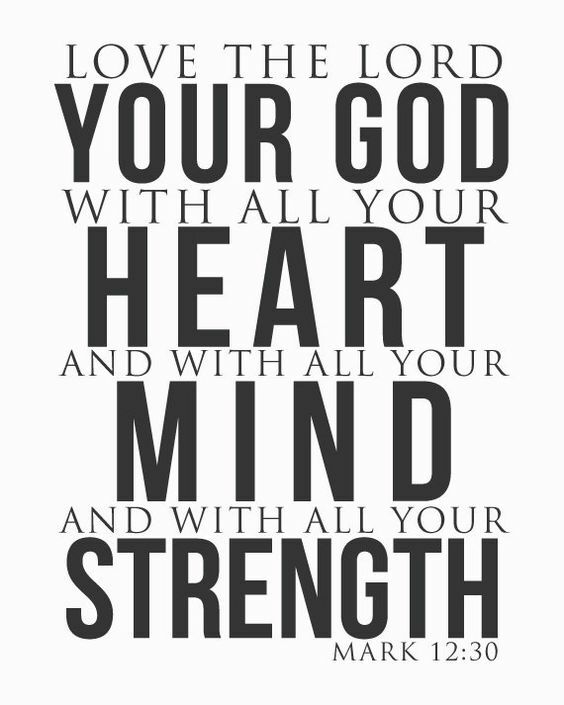 If we love God with everything we have and are then we will naturally love those who He loves. But Jesus knew that this might be hard for us so he give us a concrete command to remind us to not miss the point. It would be so easy to become absorbed in loving God with everything that we forget that He sent us out with a mission. This is the danger of every church. To become so focused on one area that we forget the other. Most times the older the church is, the more we fixate on loving God, and forget to love the community we are sent to reach. It is not an either or, it is a both and. Stewardship is not just about our relationship with God, it is also about our relationship with the world around us. Here we see a glimmer of hope in the story one of the Pharisees gets it. He sees what Jesus is saying and responds appropriately. Unfortunately there were other who did not. In fact in Matthew we see one the pharisees ask Jesus… “Who is my neighbor” and Jesus responds with he story of the good Samaritan. Jesus commends the ma who gets it and tells him, The kingdom is close to this man. Notice He does not say, “you are part of the kingdom” instead he tells Him you are close. Unfortunately close only counts in hand grenades and horseshoes… not in the kingdom. Stewardship is the response-ability of the disciple. Because of all He has done for you. So here is the question? What has he done for you? What has He given you? How do you respond to that? with gracious love or with selfish stinginess. After this last encounter the Pharisees and the Sanhedrin stopped trying to trap Jesus. They had learned that that would not work. This is a famous riddle how could Jesus be David’s son, and be his Lord as well. The only way this works is if Jesus is God. If He is eternal. but what does that have to do with Stewardship? These next few verses seem to not have any place in this discussion of stewardship until we realize that Jesus is once again reminding the people of the truth that he had taught them with the tribute coin. Jesus is Lord. Lord is more that savior, more than God. Lord is a relational word. You cannot be lord without a servant. There is a leadership axiom that John Maxwell says. He who thinks he is leading, but no one is following, is just talking a walk. Jesus is lord! and we are His disciples. You cannot be a disciple if Jesus is not LORD. You cannot be a steward if you are the owner. IF you call the shots you are not His disciple. If you do not do what He desires with what He gives you you are not a steward. While the Pharisees may be done trying to trap Jesus, Jesus is not through revealing what is in their hearts. This is important to us as well. Just because we might think we have arrived. That we are spiritually mature, that we have all this licked. Jesus still has work to do on us. He still desires to help us acknowledge His Lordship in all of our lives. We might say well I come to church on a regular basis, that should be enough. I give God what I can, I read my Bible, I pray for the prayer request that I get in email. God knows I try to live right. That’s enough right? Let me say this, God does not love you any more and any less based on your discipleship or stewardship. But He desires more of you, because we wants you to be in a closer relationship with Him. H wants you to know Him more intimately and know His love, care and concern for you on a deeper level. He desires to make you all you were meant to be but that requires us being willing to give up ownership and control of everything so He can be LORD. He calls out the Pharisees for desiring what they want to gain in life, and by using the resources God has given them (leadership, knowledge, power and prestige) to instead of serve and love people, but to cheat and pridefully lord over people. Jesus tells us when we don’t do the right thing with what He gives us there will be consequences. God is not fooled, when we do not do what he asks of us. Finally, Jesus address head on the issue of finances. He looks at what is being given at the Temple and He wants to teach His disciples what real giving looks like. Remember these are red letters These are Jesus’ words not mine. He looks at His disciples and reminds them that the amount is secondary to the sacrifice. True giving, true stewardship is based not on an amount. It is based on the sacrifice to our own well being. Ultimately, she was willing to trust God, to love God with her whole heart, soul, mind and strength. With everything she had. And Jesus points to that and says thats what real stewardship looks like. Are you a disciple? Are you a good steward? Lets Pray.